In Summer and Fall 2011, lots of new features and tweaks were added to O-Space. This it the first post in a series introducing some of the changes. Let’s start with the best new feature – course e-portfolios. You can now share e-portfolios with your students by embedding them into a Course. Since it based on groups, you no longer need to add each person one at a time. This is especially helpful if you use an e-portfolio as your syllabus or want your students to contribute to a shared e-portfolio. You can associate multiple e-portfolios with a course. When you go into a course (or community), you should see a new tab called e-Portfolios. 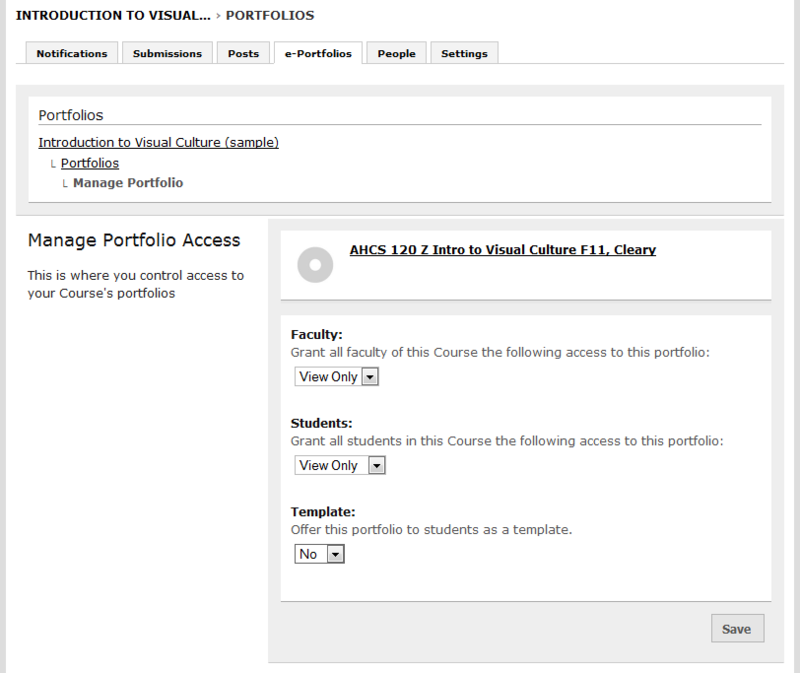 For all Fall 2011 courses, the e-Portfolios tab should be turned on by default. If the tab is not there, you can turn it on by going to Course → Settings → General Info. Near the bottom of the page find “What tools do I need?” Click the box for Portfolios, then click Save. Tip #1: Create the e-portfolio you want to share with your students before linking it to the Course. Tip #2: Make an edit to e-portfolio right before adding it to a Course. When you are ready to share an e-portfolio with your class, go to Course → e-Portfolios → Add Portfolio. Click on the Search >> button. (Ignore the option to create a new e-portfolio; no need to enter anything into the Search by name box.) It will return a list of up to 10 of your e-portfolios in order of last edited. Find your e-portfolio that you want to share with the students. If you followed Tip #2 above, it should be the first one on the list. Click the Add >> button. For Students, change it to “View Only”. After all, what use is a syllabus e-portfolio if the students in the class cannot see it? Click the Save button. The e-portfolio now appears in the Course → e-Portfolios tab. Admin – in addition to Publisher abilities can access the e-Portfolio settings page to change the header, title, URL, access, etc. You can still add other people, even if they already belong to the “faculty” or “students” group, to your e-portfolio via the Portfolio → Settings page. If there is a conflict, the higher level of access will apply. If a person has both Editor access (as an individual) and View Only access (based on group), she would have Editor abilities. When assigning levels using the dropdown menus, Students can only have equal or lesser access than Faculty. 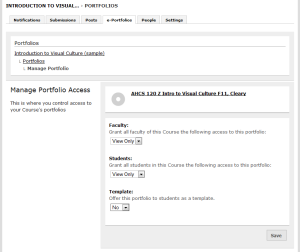 To give the student group more access than the faculty group, go to the Portfolio → Settings page. You can make a course syllabus available as a “template.” This is helpful when you want the students in your class to create their own e-portfolio using the same structure and look as the course e-portfolio. Or share a common e-syllabus with other instructors teaching the same class. To designate an e-portfolio as a template, just choose “yes” from the dropdown menu. 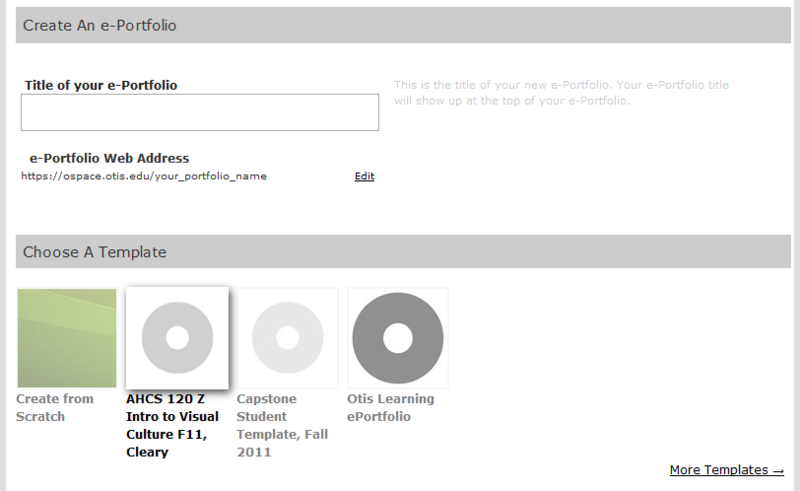 A new button will appear: Create e-Portfolio from Template. When anyone in the course clicks that button, they will be taken through the normal Create Portfolio process. 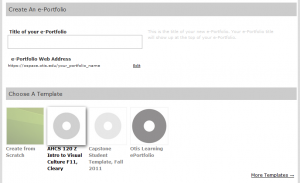 However, in the Choose A Template section, the course e-portfolio will be highlighted. At any time, you can change the access to a course e-portfolio. You can turn on or off the template option whenever you want. If you no longer want to associate an e-portfolio with a course, go to Course → Portfolios. Click on the Remove From Course button. That’s it. Note: Removing an e-Portfolio from a course will not delete the e-Portfolio from O-Space. You should be able to re-associate an e-portfolio with the course later. Check out the Learning Portfolios section on the Otis website.